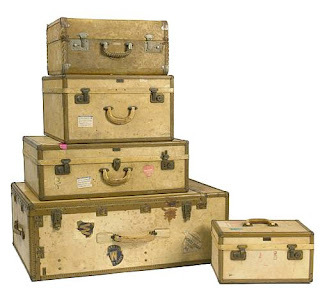 There are all sorts of ways to incorporate vintage luggage in your decor. Suitcases stack to make a table, and trunks make great coffee tables. Or they can just look decorative! 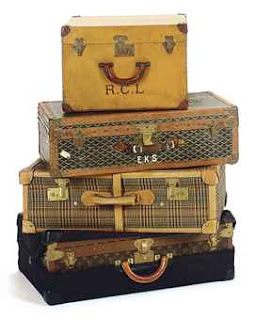 The Louis Vuitton trunk or stacked suitcases always looks fabulous. In this case a steamer trunk makes a great coffee table. 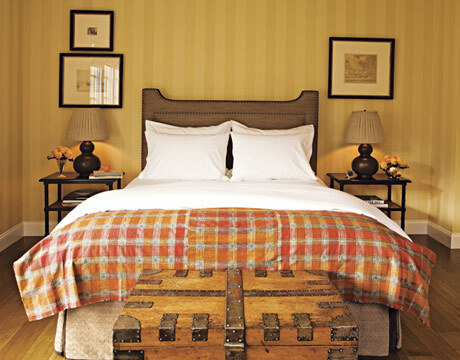 A nice wood trunk with leather strap detail make a great bench at the end of the bed. 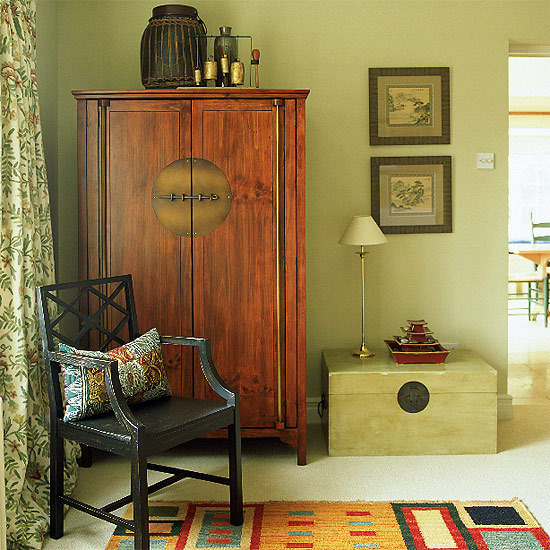 A classic Chinese trunk with decorative lock detail is a very chic option for a table. Auctions are great places to source trunks and luggage. At the June 19th and 20th auction at Bonhams in Los Angeles they have this great set of five pieces of Hartman luggage (Lot 8403). This would give you lots of stackable options. I think the cream color with brown trim is quite chic. This has an auction estimate of $800 - $1,200. The next Christie's Interiors sale in New York June 21st and 22nd includes this set of four French suitcases of various makers (Lot 587). I like the fact that they are different because it makes for a more interesting stacked design. These have an auction estimate of $2,000 - $3,000. 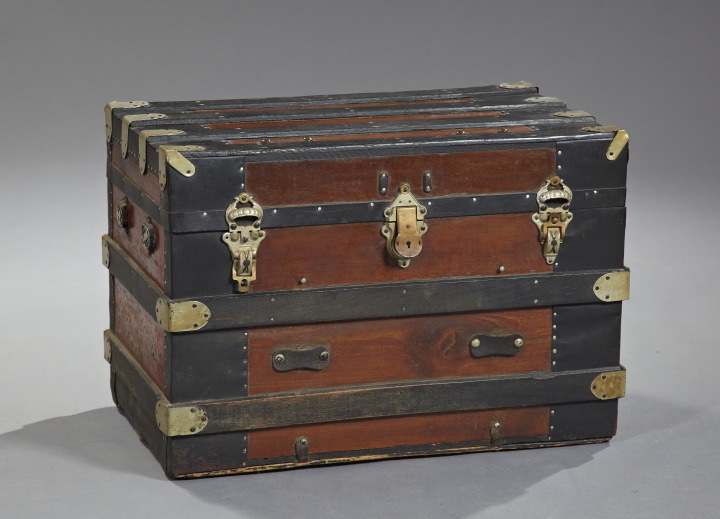 The Christie's sale also includes this 19th century Italian leather trunk with metal binding. This has that great look of the trunk at the end of the bed in the photo earlier. This would make a terrific coffee table or bench. This is Lot 560 and has an auction estimate of $500 - $700. This American late Victorian steamer trunk, ca. 1900 sold at a New Orleans Auction for $492 off an auction estimate of $75 - $125. The straps and the brass hardware make this quite decorative. Put this in a casual room and even use it for extra storage. 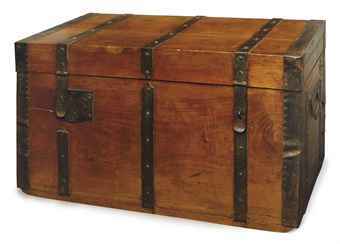 I always like a Chinese trunk as a coffee table. I have a red lacquer one. This one that sold at a Brunk Auction in North Carolina is particularly decorative. 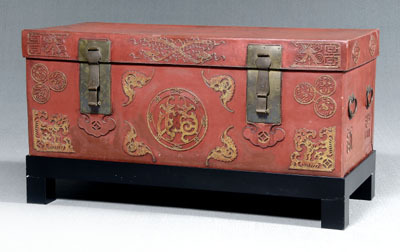 The large Chinese leather trunk is on a stand and has gilt accents, stitched and applied ruyi scepter, bats, characters, dragons, large brass lock plates with two locks and key, four bronze handles (late 19th/early 20th century). This sold for $600 off an auction estimate of $500 - $1,000. 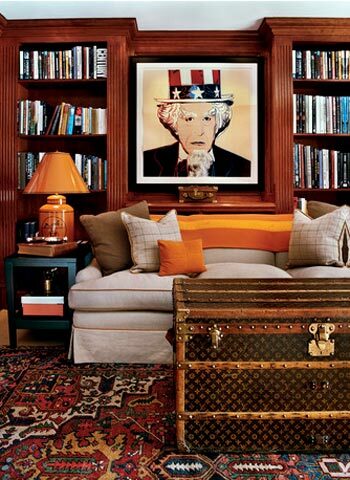 Trunks and luggage make for an interesting alternative to furniture, and can be very chic. 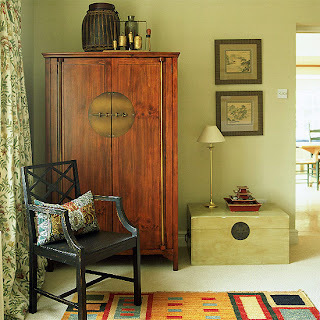 Keep your eye out for bargains, and collect a few pieces over time for an eclectic look.